This upcoming Friday marks another installment of The Art of Fashion's pop-up show at the Chelsea Room. 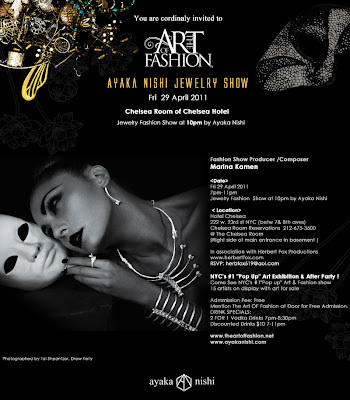 The night is packed with ten artists, a jewelry fashion show from designer Ayaka Nishi and a special live musical performance by Tomoko (aka "The Asian Empress of Soul"). Ayaka Nishi Jewelry Collection from stephen dirkes on Vimeo.